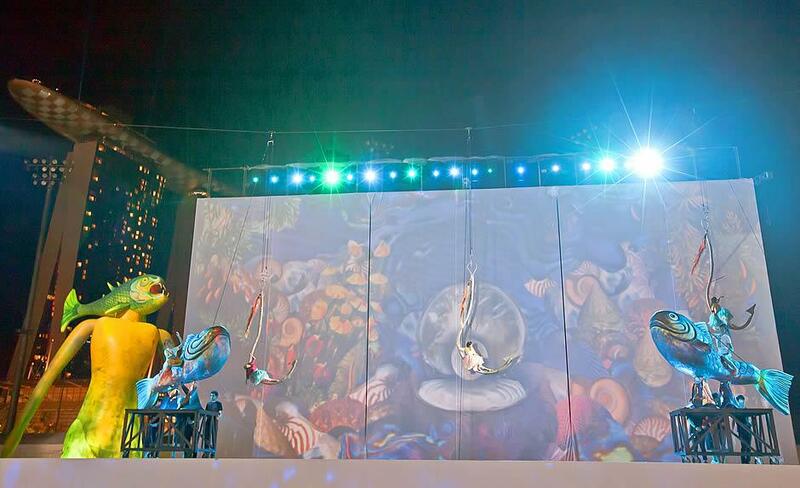 Besides the most awaited Formula One competition that took place in Singapore, the Grand Prix organization has offered its audience a top-level artistic event: Oceans Symphony, a spectacle specially commissioned spectacle for this year’s racing event. Oceans Symphony featured the Studio Festi, an ensemble famous throughout the world for its extraordinary choreographies and scenic installations in large open-air spaces. The set’s backdrop was formed by the three main (82′ x 39′) screens; these were surmounted by sections of trussing carrying part of the lighting rig. Fixtures have also been installed over lighting towers, and placed on the ground.